The Mr Gum books have received rave reviews from readers, book awards, and countless short listings. They are strange and spooky tales, with strange characters and even stranger happenings. The central character is Mr Gum, an evil, conniving person who invents ways of manipulating the townsfolk for his own interests. The freaky illustrations of some of the townsfolk of Lamonic Bibber are found just before the introduction and other illustrations are interspersed throughout the text. Mr Gum is on the cover of every title. It appears that nine year-old Polly is not immune to the incredible happenings that seem to be common in Lamonic Bibber. Jakey her dog digs up a bag marked with the date, 1559. It contains two luminous stones in pink and white. Polly locks them away at home, and dreams that the stones speak to her, telling her to take them to the windmill. Their strange spell envelopes her and she is forced to do their bidding. The pulsing light from the Power Crystals leads Polly to a place she’s never been before then on to a windmill she didn’t know existed, although she is very familiar with the area. She sees Mr Gum’s face reflected in the moon and then at the window at the top of the windmill. This is a bad sign. On awakening, she sees her feet are dirty, the stones are in her hand and she’s wearing a T-shirt that boasts of her visit to the windmill. But she will get to the bottom of it all! Polly visits Old Granny, the wise old matriarch of the town that everyone turns to for advice. 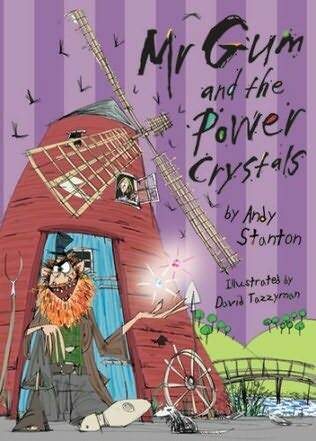 But the crystals keep leading her to the windmill again and again. Mr Gum, her nemesis is there; repulsive as always and as determined as ever to win her over. The Power Crystals tempt Polly by giving her visions of what she could be. Will the child succumb to temptation? Will Gum get his way? Normal doesn’t exist here, so for readers looking for a fluid, coherent storyline, these books will not suit. But for the 9+ age group who want the unusual wrapped in comical and outrageous happenings with lots of laughter, Mr Gum books are a clever creation. With a constant play on words which is highly entertaining in a mixed-up, crazy way that children love, they can become highly addictive reading.